You are currently browsing the category archive for the ‘Canada’ category. 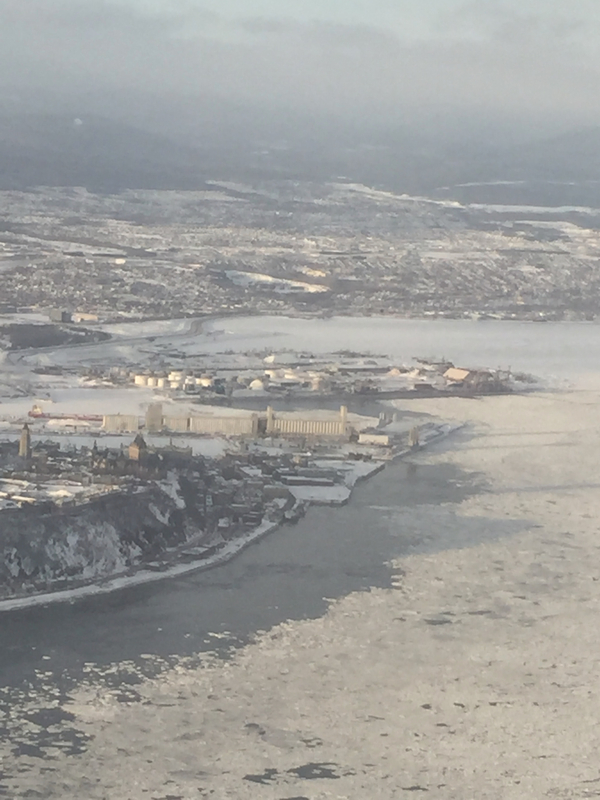 This photo comes from the Chantier Davie Canada, aka Davie Shipyard, across from Quebec City, taken in the first half of this month. 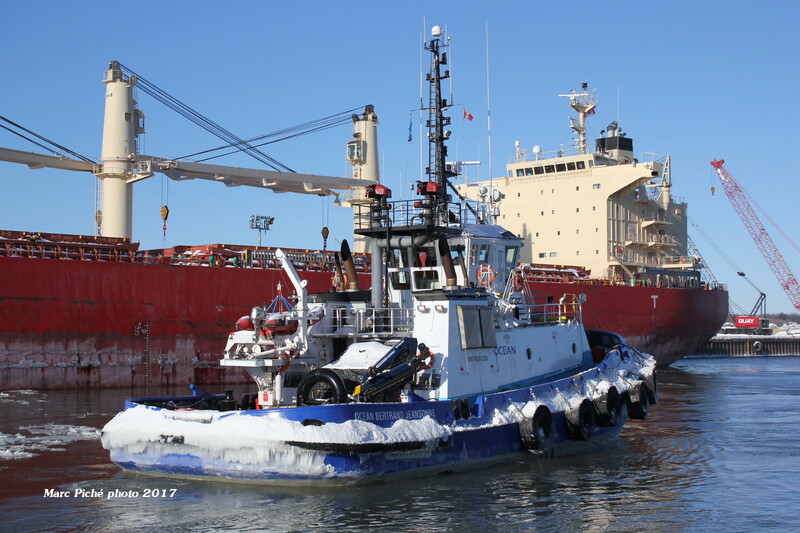 Two Ocean tugs assist a repurposed AHTS/Supply Ship Viking Vidar into the Davie’s docks to complete the transformation from private to public. Click on the link in the previous sentence to see her in her Arctic colors. 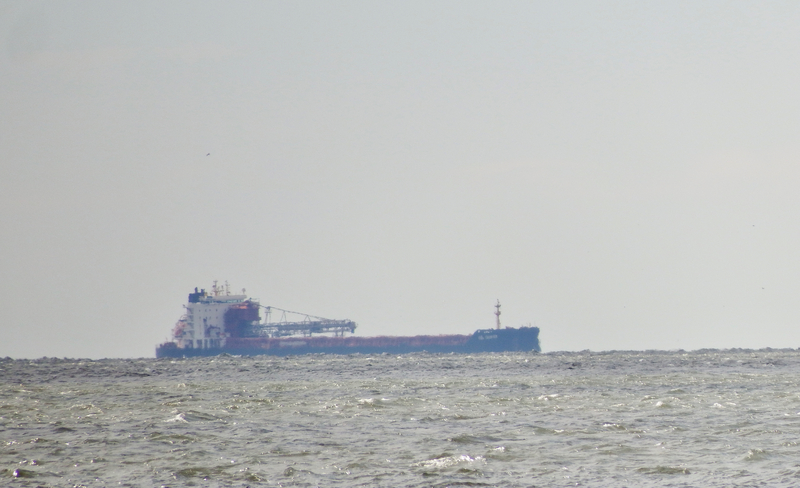 I wrote the names of the two Ocean tugs somewhere, but . . . Maybe someone can help. 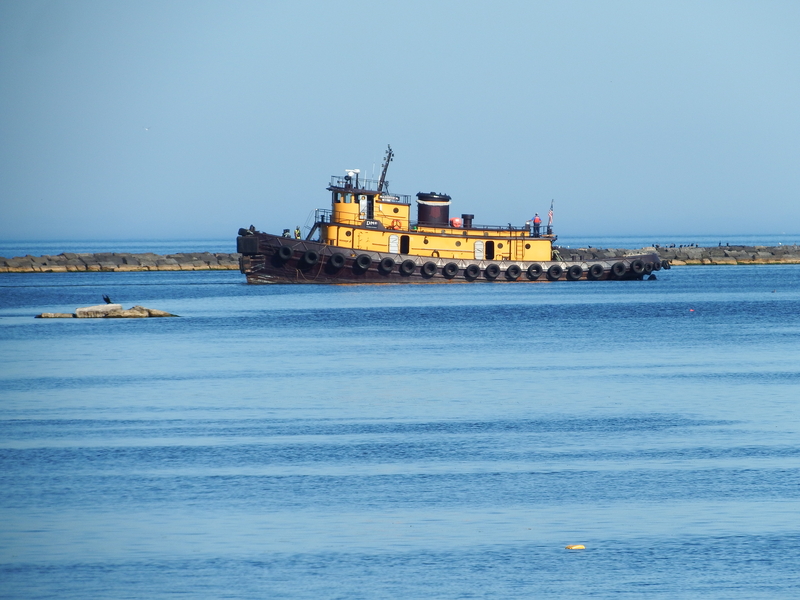 She formerly flew the Russian flag and was home-ported in Kholmsk on Sakhalin Island. I sometimes call posts like these “second lives” stories. 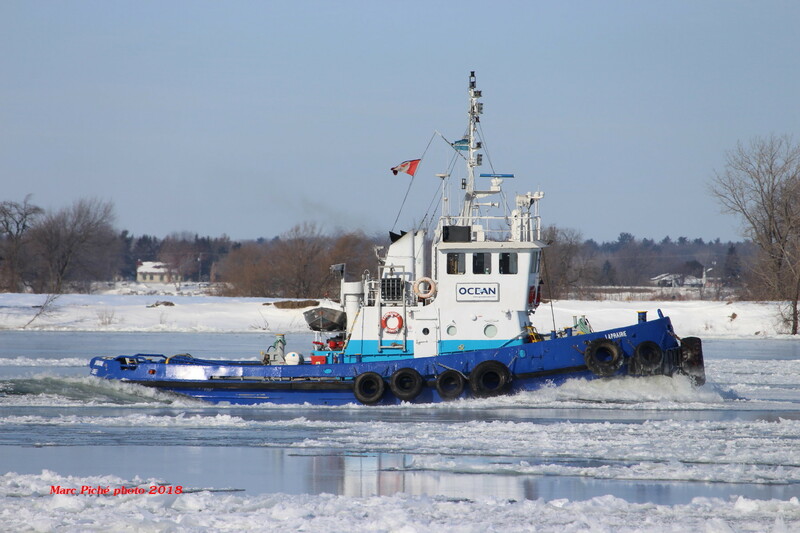 She’s been renamed CCG Molly Kool, her namesake being a Canadian-born US sea captain. 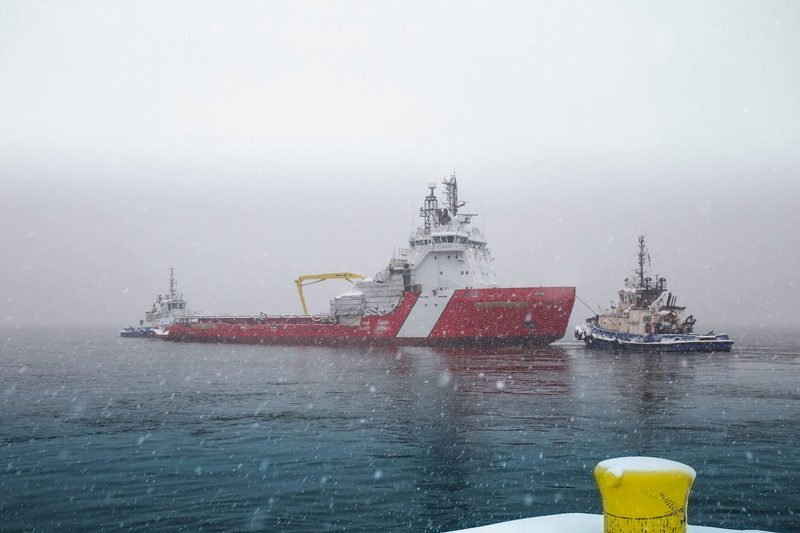 For posts with Canadian Coast Guard vessels, click here. In other news, if you don’t see Ocean Taiga in Quebec City these days, here’s a development from last summer that I missed. This also explains why Ocean Delta now flies the Jamaican flag. And just for the record, as of 1030 this morning, I’ve received about 30 emails, over 20 of which have the words “cyber” and “giving” in them. Enough! Andrew J graced this port I’ve passed many times both by water and highway. Any guesses where I took this photo? I watched their July 4 2016 fireworks. Answer follows. That power plant opened in 1950 as well; it’s shuttered and a plan to repower it from coal to natural gas has fallen through. Andrew J is a 1950 build, less than 50′ loa. 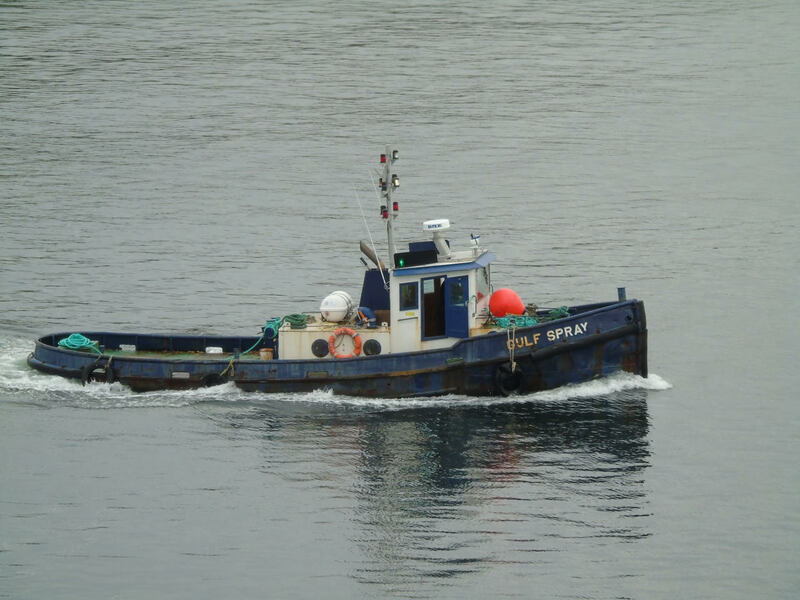 I took a photo of one of Andrew J‘s fleet mates here in 2016, although then West Wind –a boat with a really random history–was working for another company. the other day caught her in Fair Haven NY. Kurt R. has previously appeared on this blog here and here. Any guesses where Gulf Spray does her work? I suppose the paint on the light house may be a clue. Closer up . . . both these photos come thanks to Justin Zizes. Gulf Spray, a Nova Scotia 1959 build, works in Halifax. And finally, the flags are a clue here. 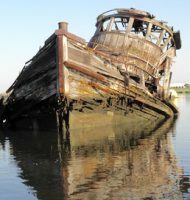 Spes was built in 1946, and the photo comes thanks to Jan van der Doe. It’s one of many photos he sent me months ago that I’ve been saving for a rainy–or otherwise distracted– day. 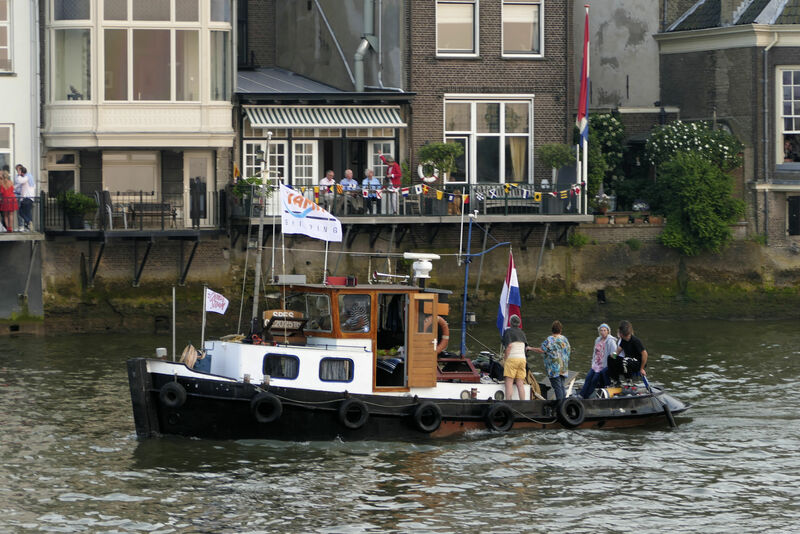 Spes, of course, is a Dutch boat. 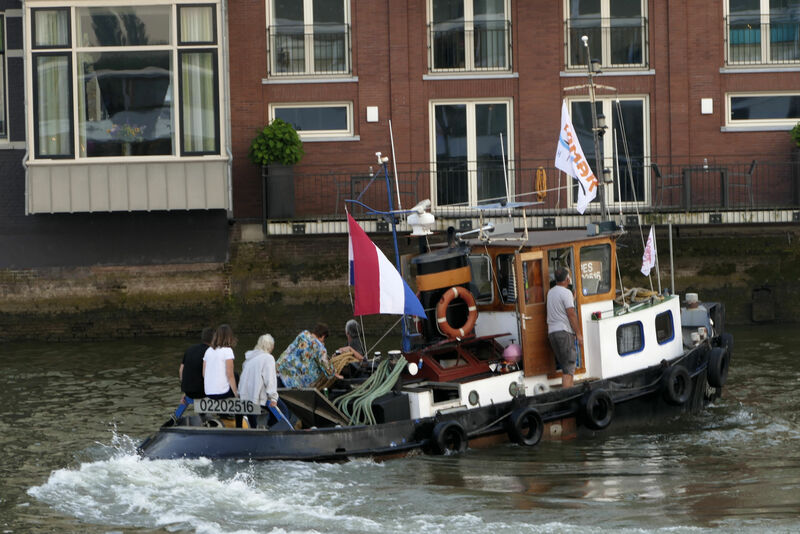 These photos were taken in the river town of Dordrecht, where I had gone in 2014 for the steam fest that happens there every other year. Thanks to Jan and Justin for sharing their photos. 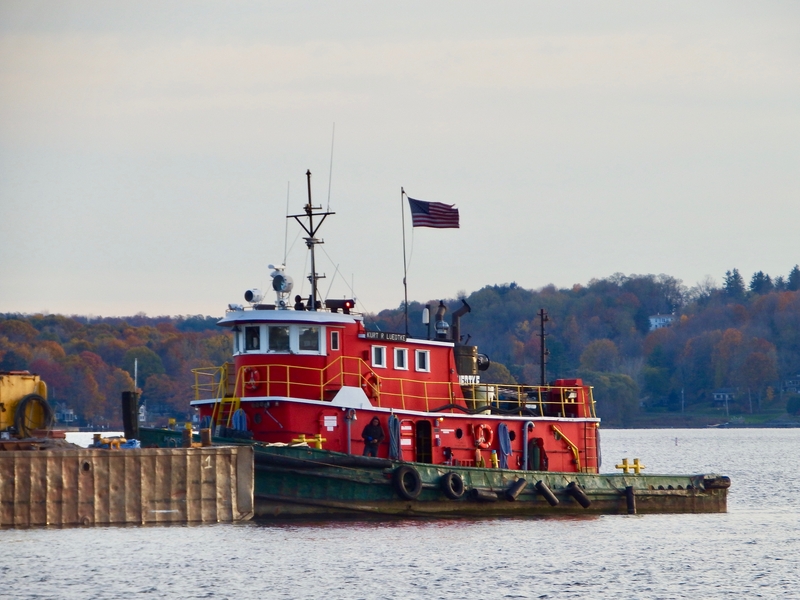 The lead photo here was taken in Dunkirk NY, where I had stopped to look for a fish tug. No dice on the fish tug, though. And let’s start with the more . . . more photos and info on previous posts. CCGS Samuel Risley appeared here. 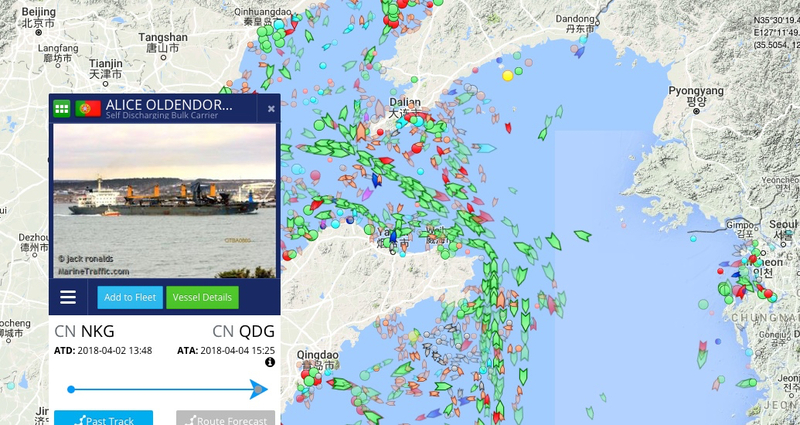 She’s currently approaching the Soo. What I didn’t know when I posted a photo of her on Lake Ontario is that she was returning from her first trip to Greenland (!! 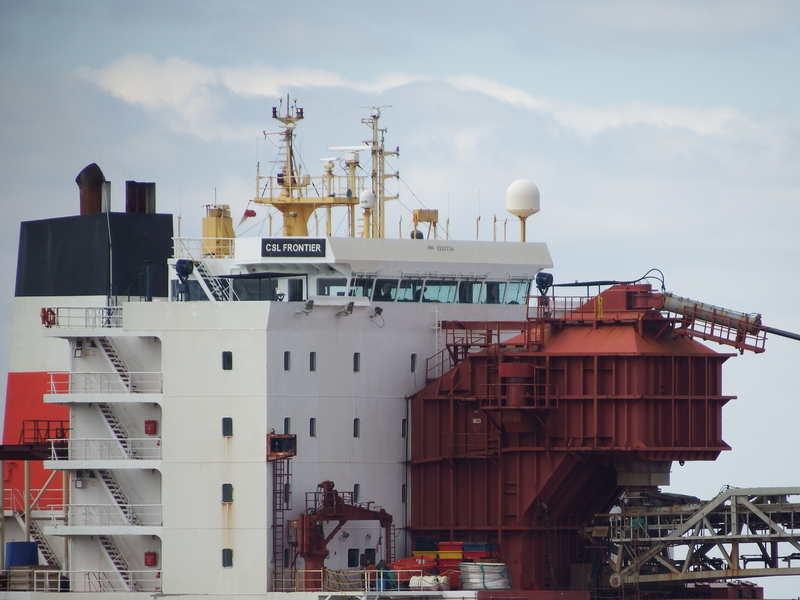 ), where she was providing icebreaking support for a supply mission to Qaanaaq aka Thule. Madison R–and I’ll do a whole post about her soon–now calls Detroit her base, I’m told. 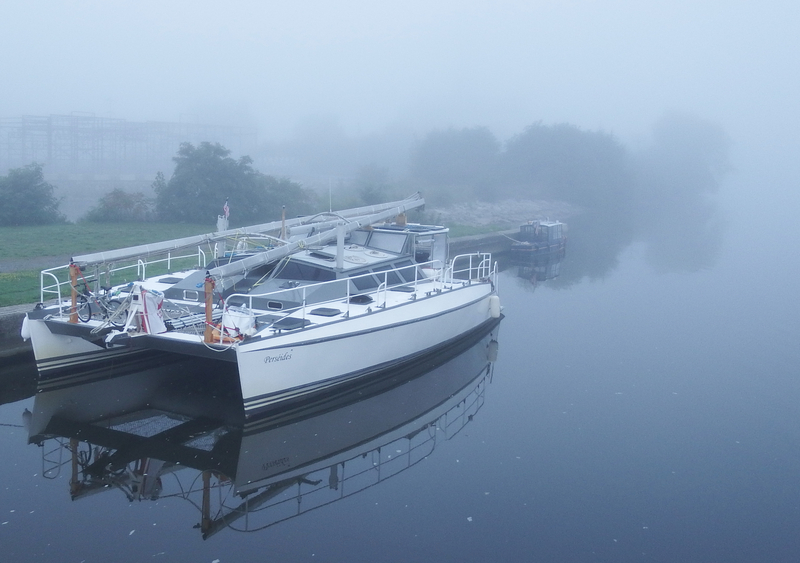 Summer fog veils a Canadian cat and an Erie Canal buoy boat above E11. 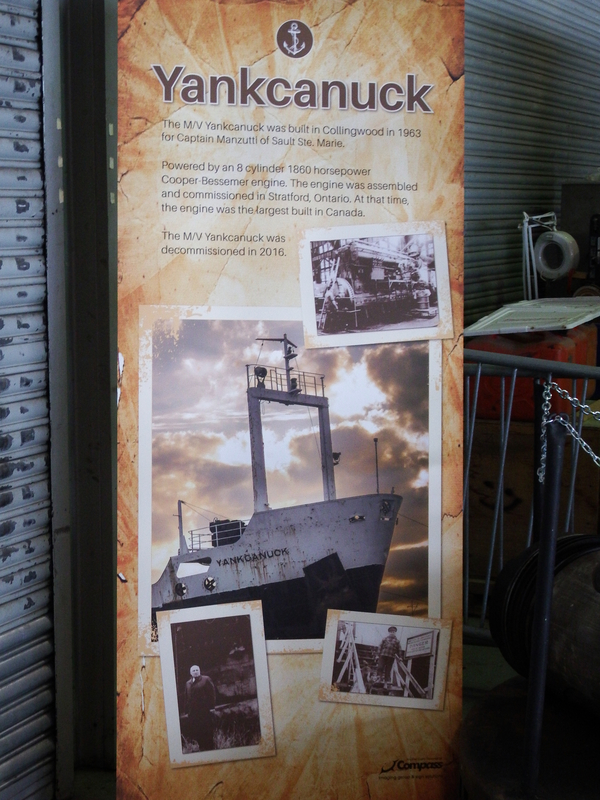 How many folks pass by Day Peckinpaugh each summer and have no clue what she is (ILI 101… launched in May 1921!! 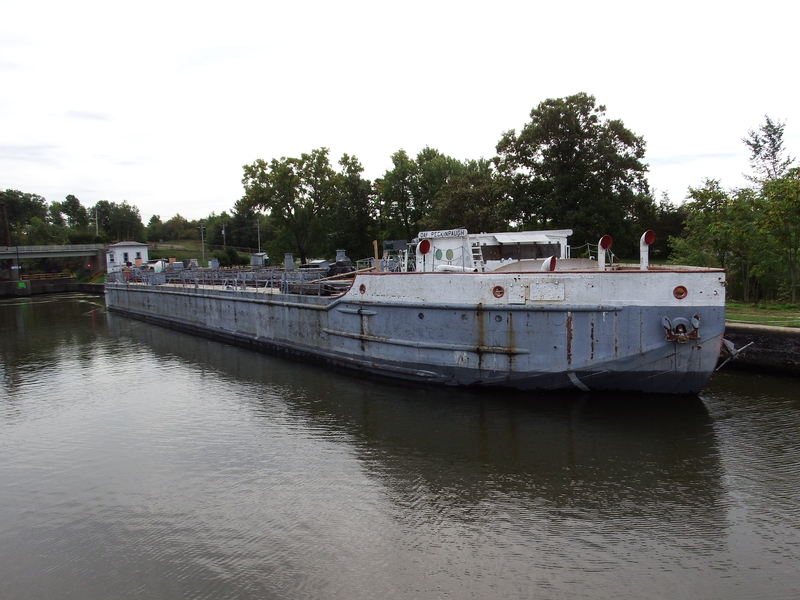 ), how long her work history (1921–1995) has been, how wide a range of waters (Duluth to Havana, I’m told) she covered, where her sister (ILI 105) languishes . . . . .
Here’s the blue-and-gold yard above E3!! Yup that’s Urger among them. And yes, the pause button on scuttling has been activated. 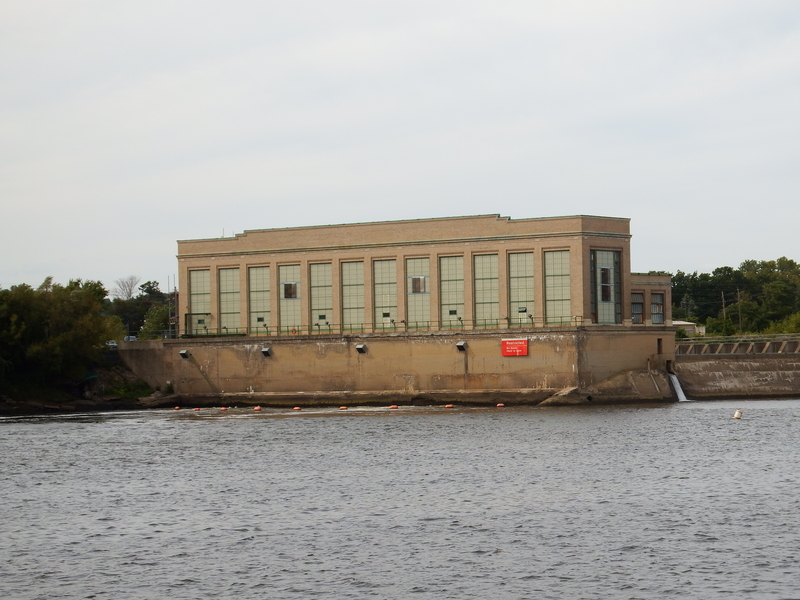 In the legends of Ford, a sign once marked this power plant adjacent to the Federal Lock in Troy as a Ford facility. Could this have become the location of Ford’s imagined electric car plant? 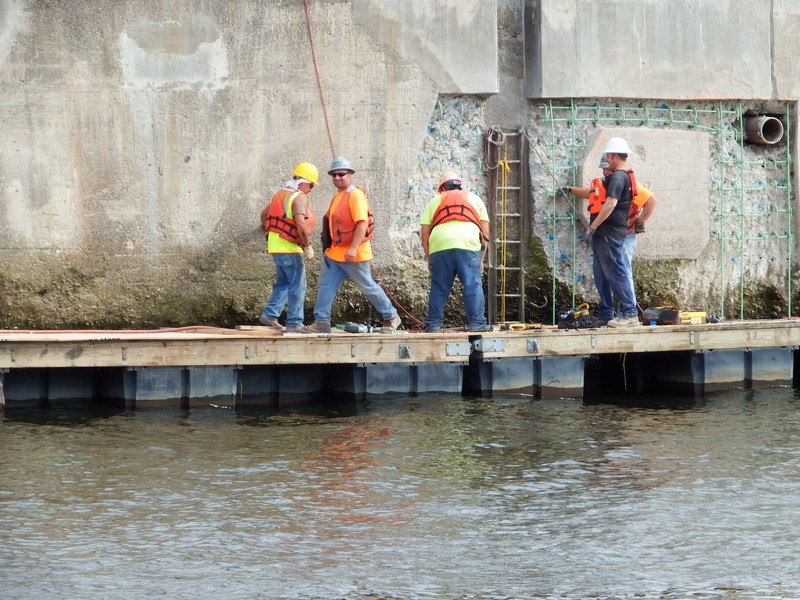 And this brings us to Troy, these walls where construction workers have staged their equipment. 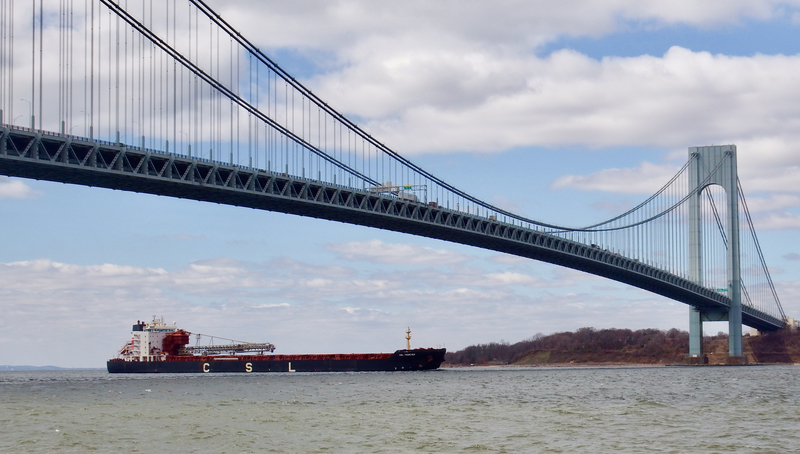 All photos by Will Van Dorp, who’s been working his way back to the sixth boro from the heartland. 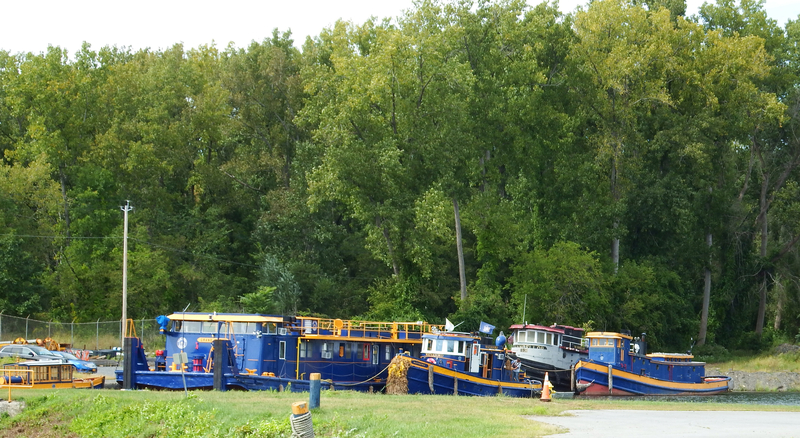 If you’re local and would like to learn more about the New York State Canals, consider joining the Canal Society and coming to their fall conference . . . on Staten Island. I’ll be involved in two events . . .
Yup . 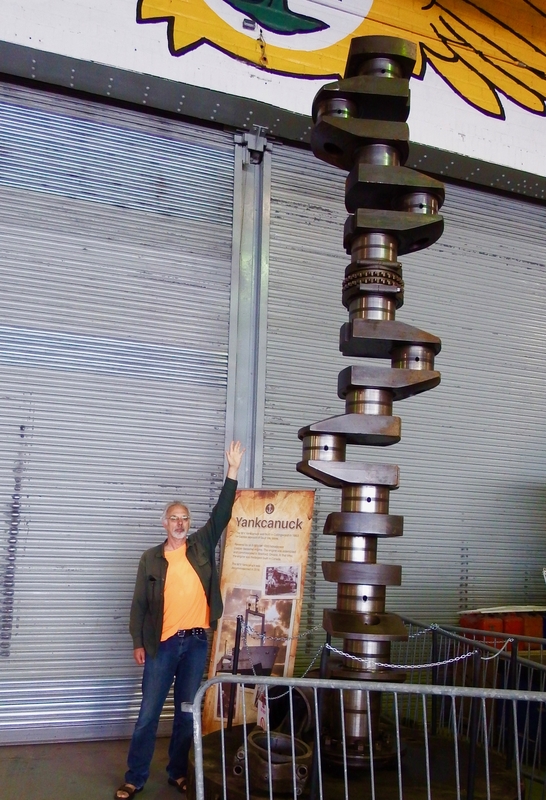 . . that’s a crankshaft. And yup, that’s a full size 6’2″ version of myself. Here’s the connection to the title. Yankcanuck . . . cool word. From 1963 until 2016, she worked in different trades, even spending some time in the Arctic. 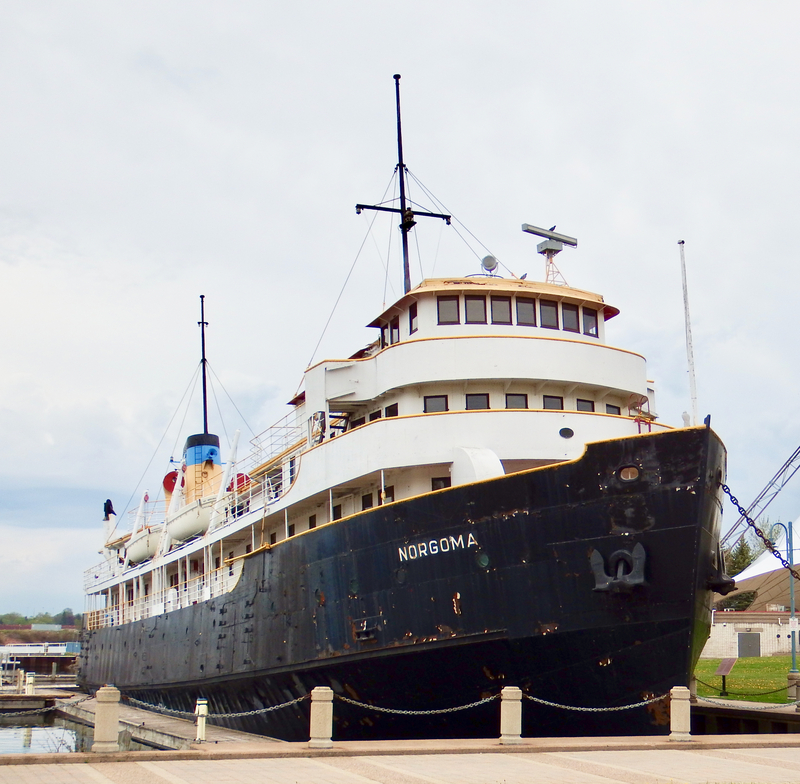 With her interesting history, I’m glad that a portion of her has been preserved for folks like me who missed her arrivals into Detroit, for example, and can now learn of her. Preserve, preserve, at least some parts. These photos by Will Van Dorp, who’s now facing a corrupted card. 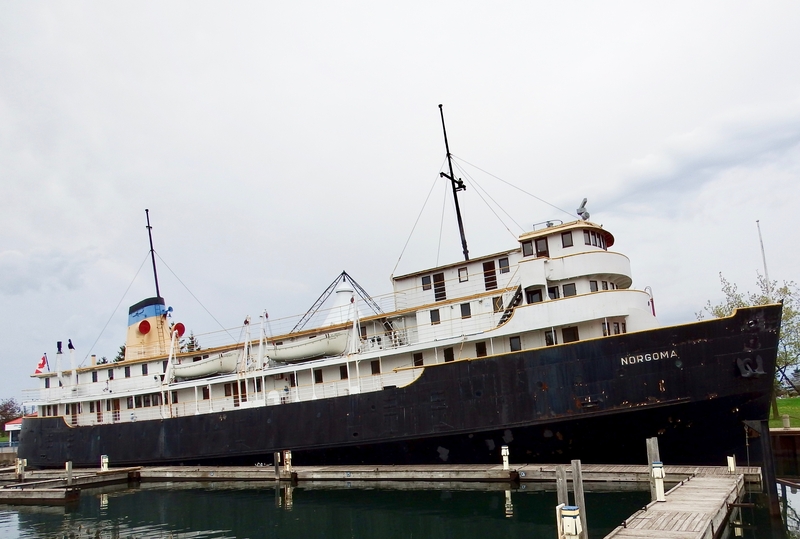 SS and then MS Norgoma worked for Owen Sound Transportation Company from 1950 until 1974. Now it’s been voted out of town. 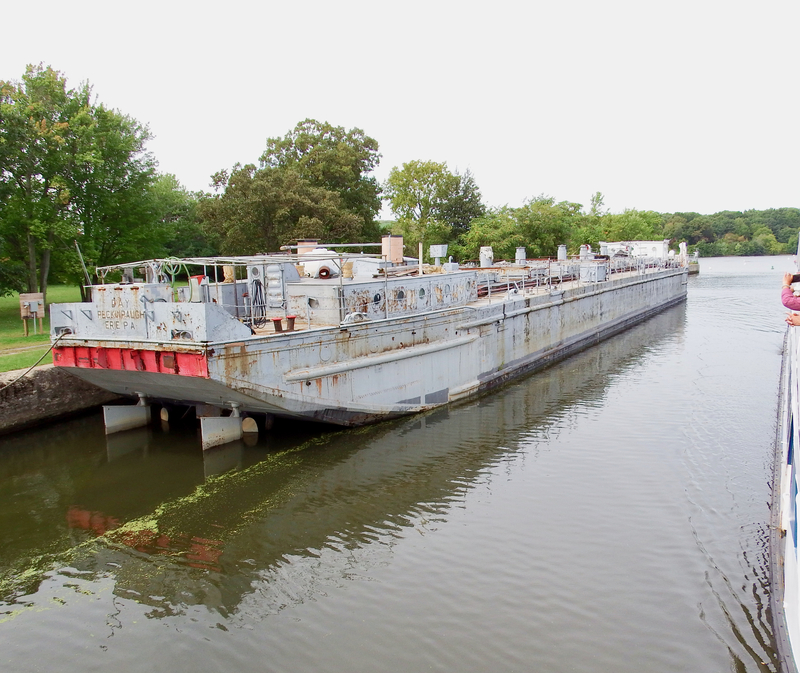 I hope something can be learned from the public process that “directs staff to look for options to remove the former steamship.” A public process is to be admired. All photos by Will Van Dorp, with thanks to Greg for suggesting I look her up. Preliminary question: Where in the world is Alice Oldendorff? Answer follows. 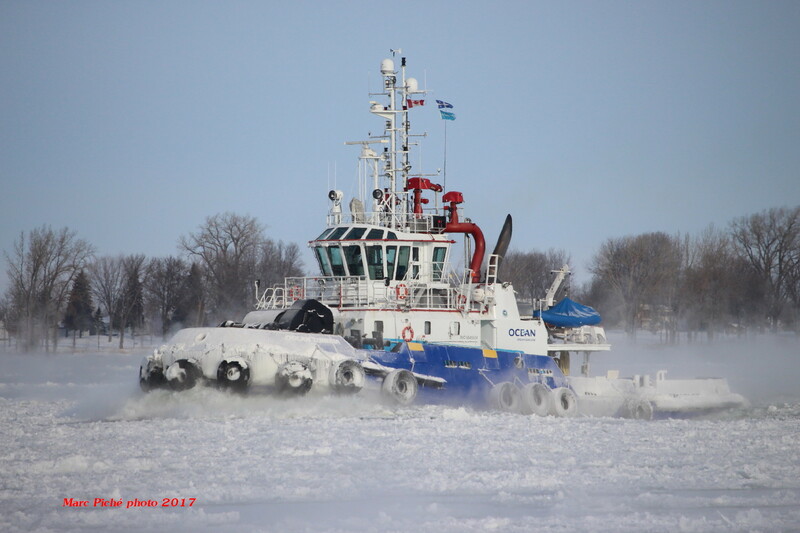 This profile below–not Alice— might make you imagine yourself in the St Lawrence Seaway or the Great Lakes. 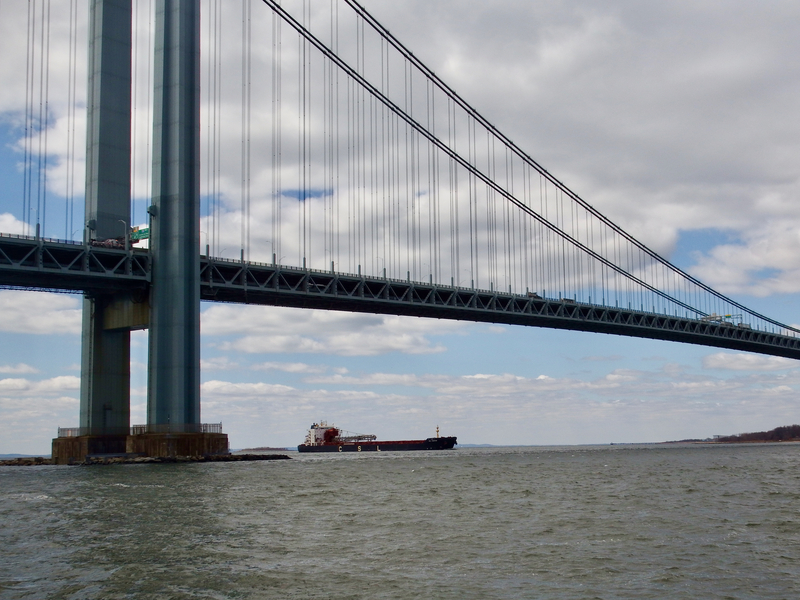 But I took this photo on the Lower New York Bay yesterday. 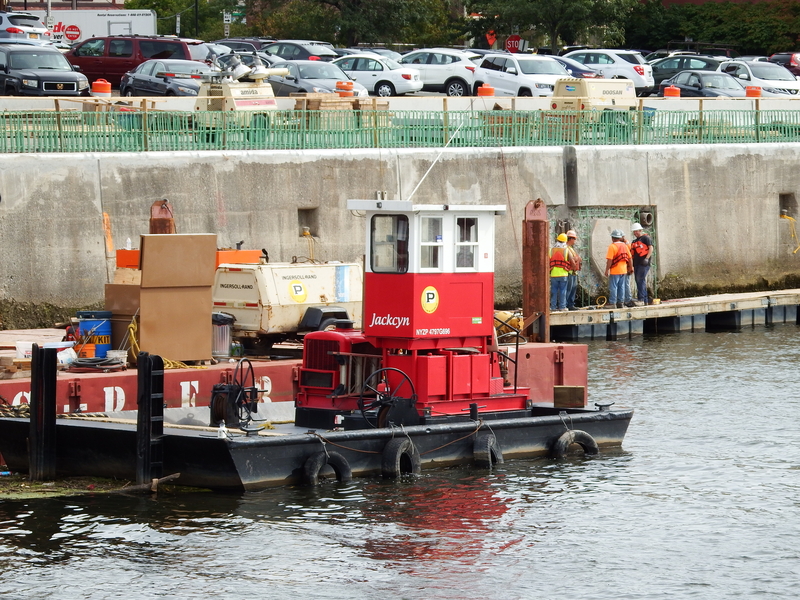 I had not caught a self-unloader of this style in the Lower Bay since 2007! 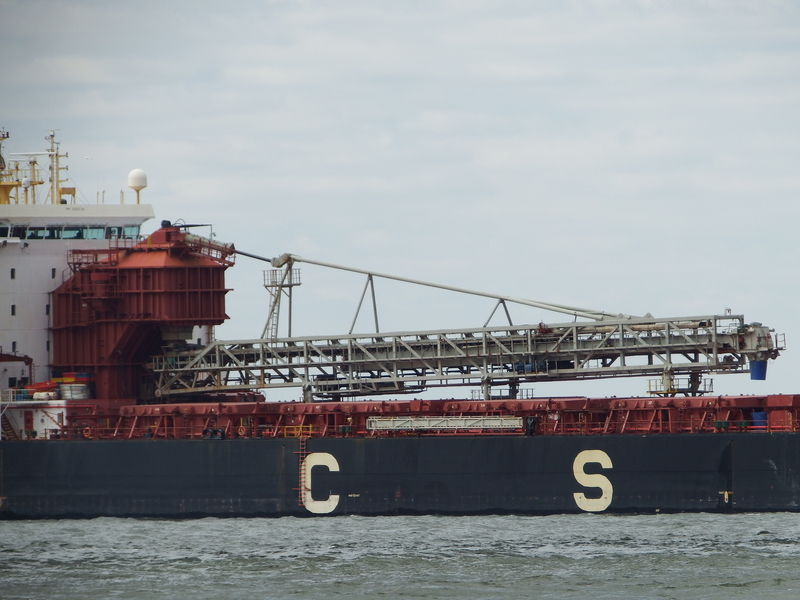 A CSL self-unloader does call in the sixth boro occasionally. 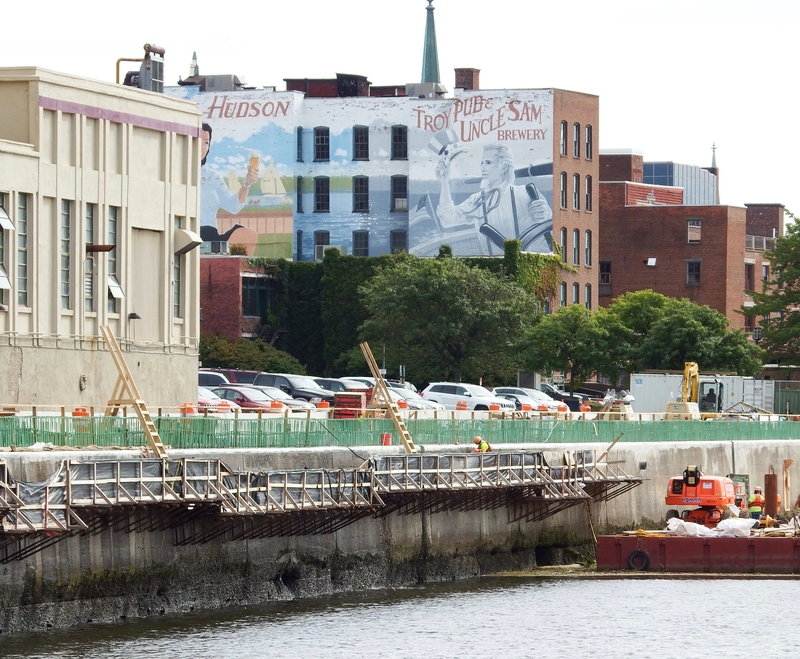 Here’s a CSL post I did in 2010, photos in the sixth boro. aggregates from Aulds Cove in Nova Scotia. And I’m guessing that’s here, place I hope to visit some day. 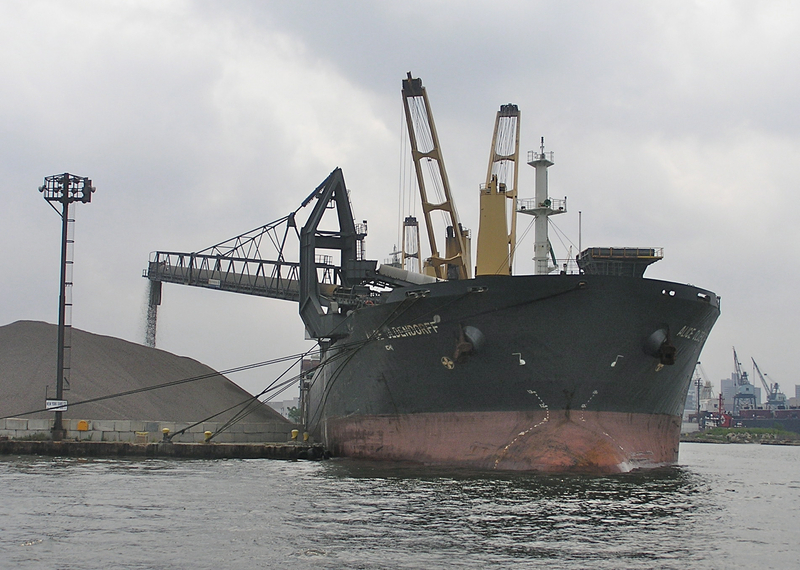 Besides stone, self-unloaders locally also offload salt, as here H. A. Sklenar and here Balder. a task usually done by fleet mate Alice Oldendorff, who surely has had enough exposure on this blog. Don’t get me wrong . 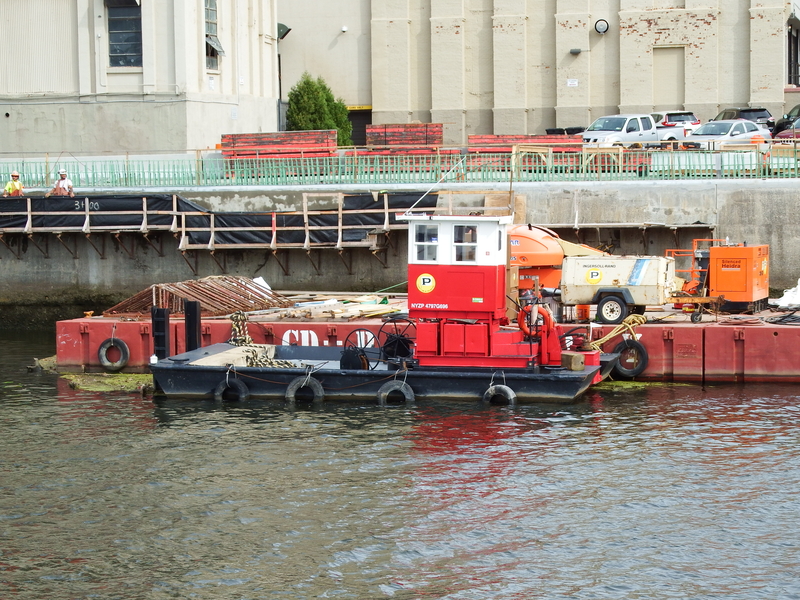 . . Alice is also a self-unloader, but she had other cranes as well, as you can see from the photo below, taken in 2009. Where is Alice? Well, she’s 300 miles from Pyongyang. THAT Pyongyang. Here’s a little more context, showing Pyongyang to the right and Beijing top left, and heavy ship traffic. 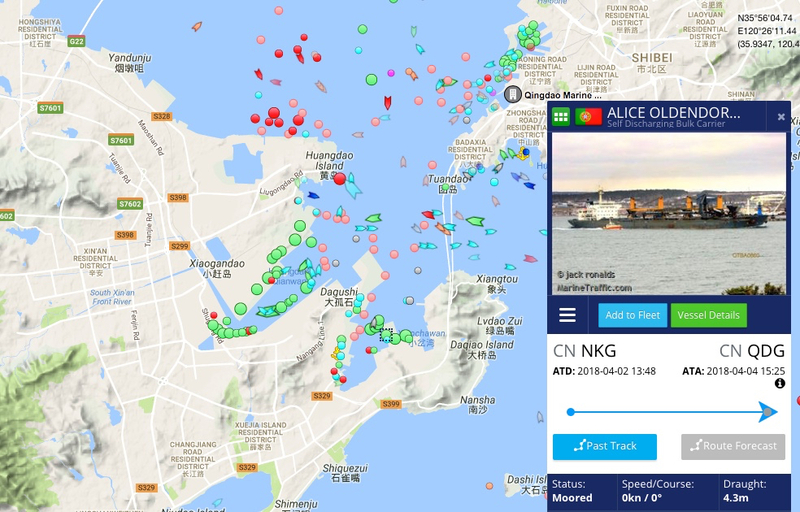 Alice made her last stop here a couple months back, then she headed through the Panama Canal to Qingdao for some rehab. Qingdao is also spelled Tsingtao, like the beer. She’ll be back come summer. 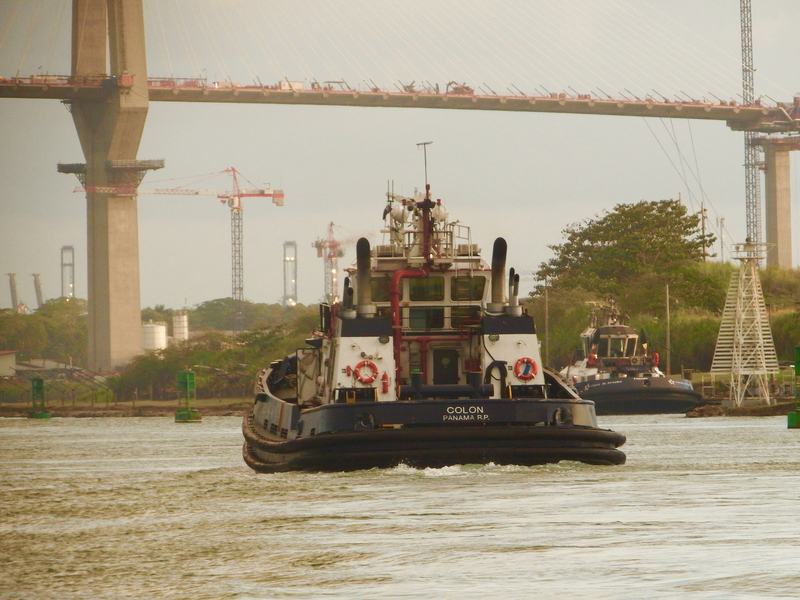 Before 2000, the Canal was operated by the Panama Canal Commission; beginning on January 1, 2000 (Y2K), the Commission was replaced by the Panama Canal Authority (ACP). 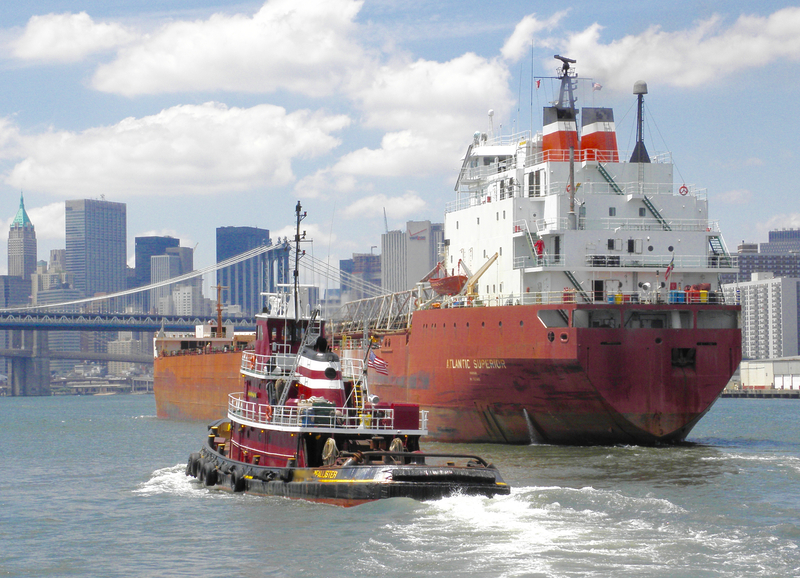 It appears the first tugs purchased by the ACP were from Canada, specifically from Irving Shipbuilding. One was Colón. It arrived in Panama in late 2001. 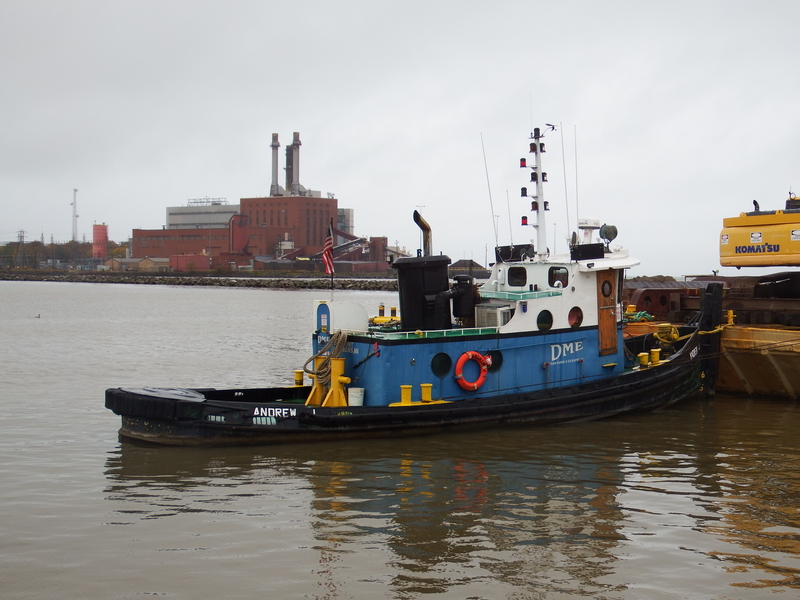 We encountered this tug near the Atlantic Bridge project, which will span both the 1914 locks and the latest set, Aqua Clara on the north end. Compared with the US-built ones in yesterday’s post, the Canadians are about 5′ longer and 2′ wider. Colón is rated at 54 tons bollard pull generated by two Deutz SBV-8M-628s produced 4400 hp transmitted by Schottel SRP 1212s with Kort nozzles. 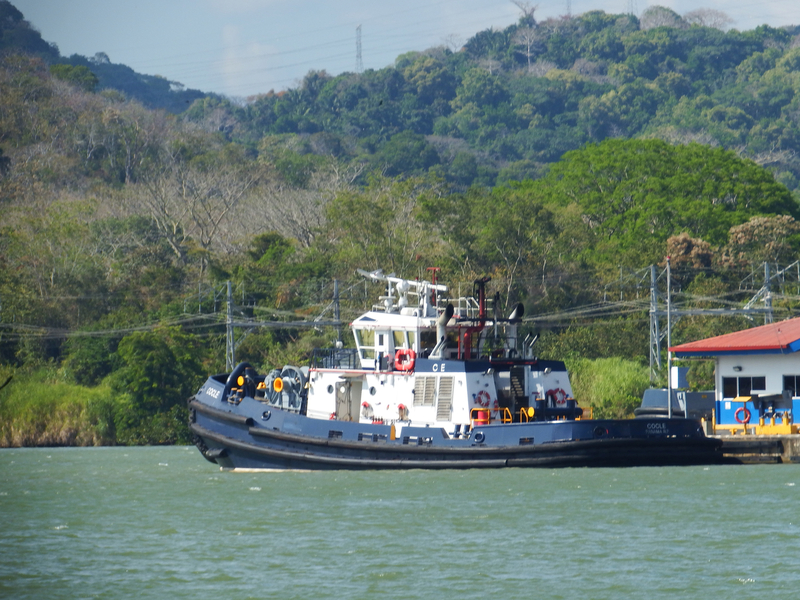 Coclé, shown here in Miraflores Lake, was the other tug in that contract. 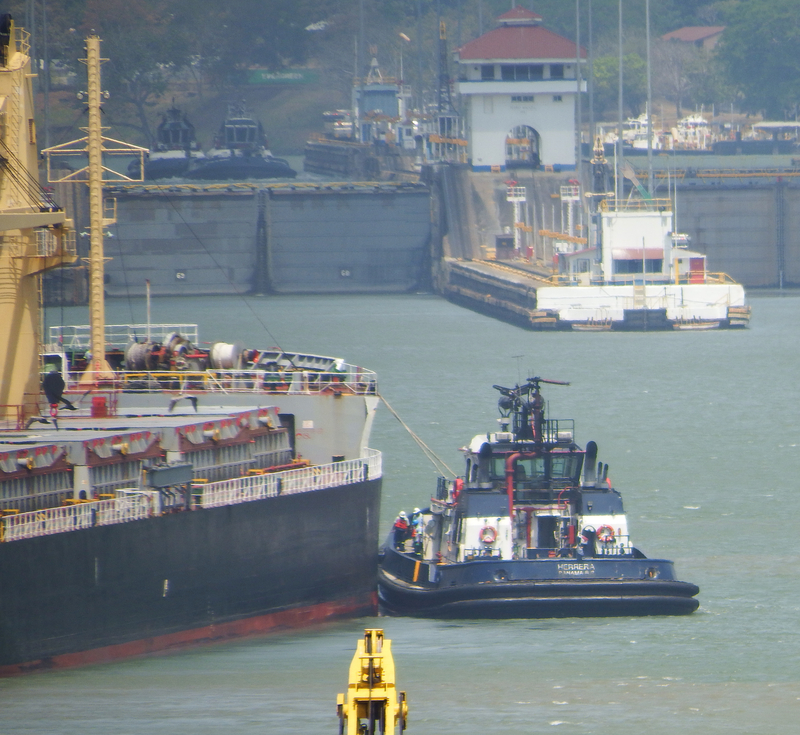 Herrera, shown here assisting a bunker from the Miraflores lock to the Pedro Miguel, fits the same dimensions and arrival time in the Canal, although I’ve not sure how to explain how the Irving order went from two to more. 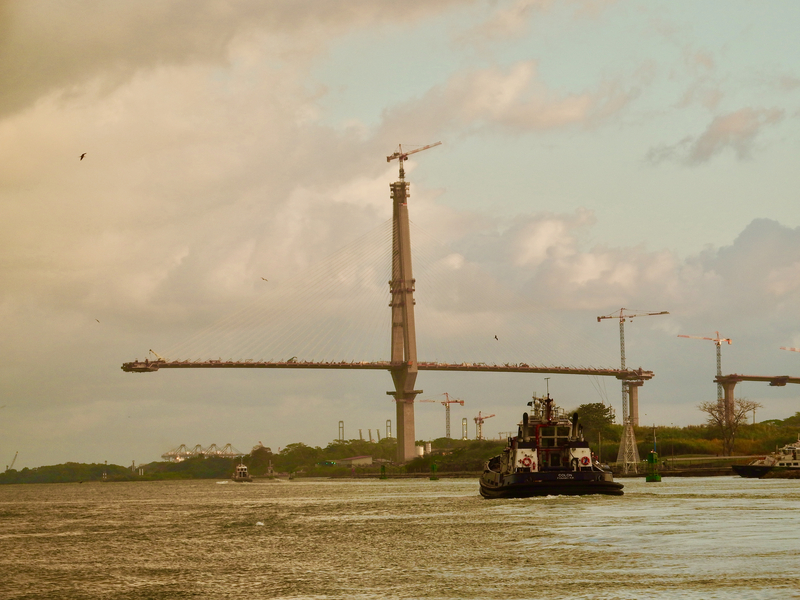 All photos by Will Van Dorp, who offers more tomorrow. 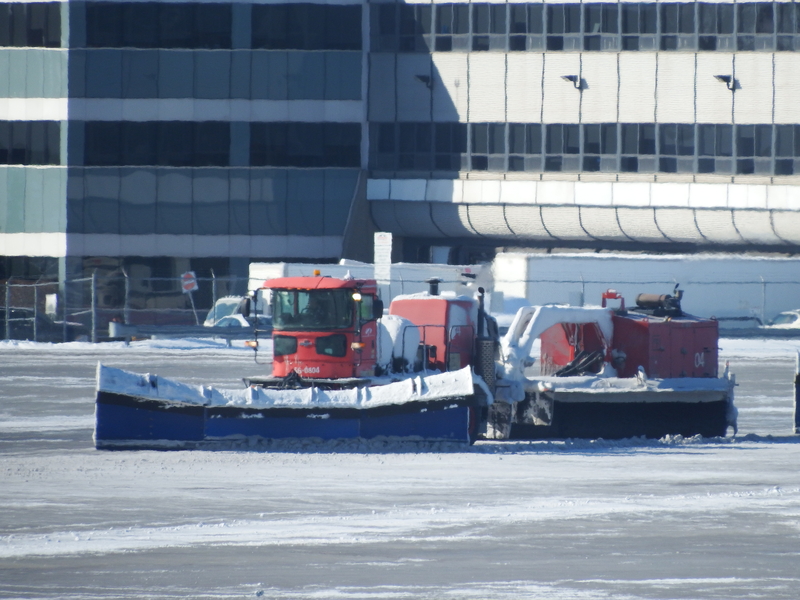 I saw a train of these in Quebec and then an identical train in Montreal, doing on an airport what tugs and icebreakers do on the nearby rivers. Any ideas on the manufacturer? I guessed Bombardier . . . 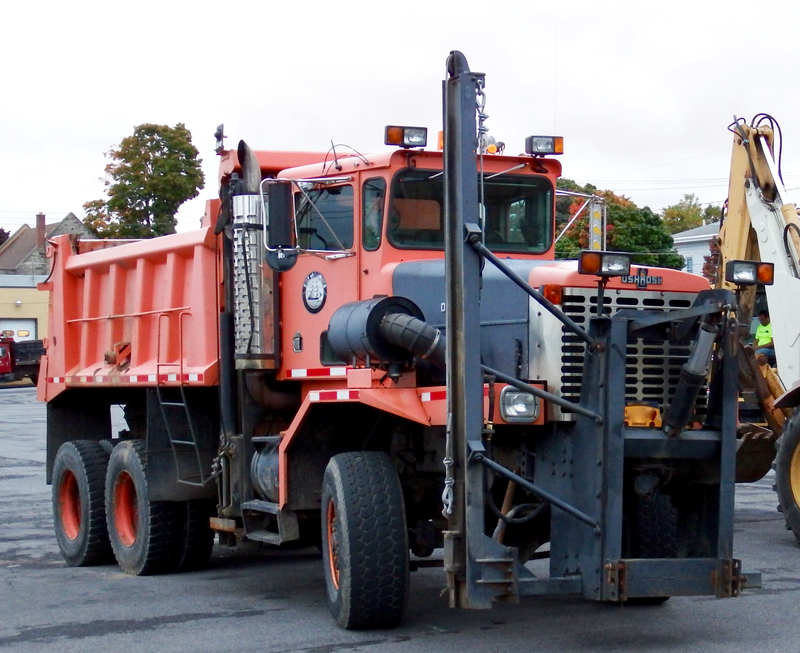 This photo I took last summer in upstate NY near the snowiest town in the state, but this is for clearing roads and streets, not airports. The one above is an Oshkosh, so how about this one? Here’s the answer. 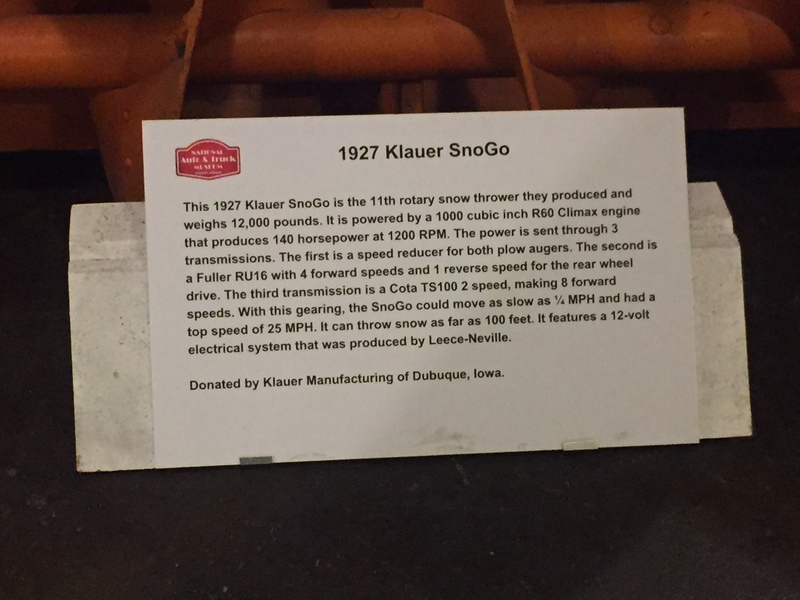 I’d have guessed Oshkosh, which started up in 1917, but Klauer made it. So the two photos at the top of the post are Oshkosh Extreme Runway System units aka XRS. 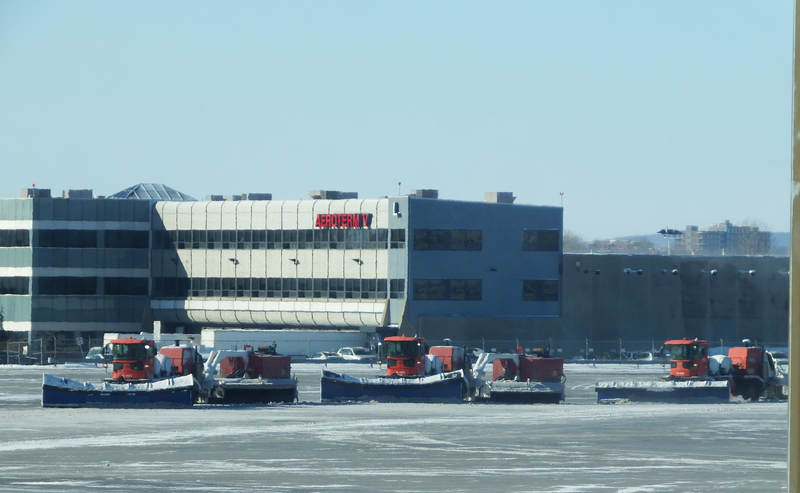 For Canadian airports these seem the right stuff. All photos by Will Van Dorp, who occasionally slurs his title to truckster. 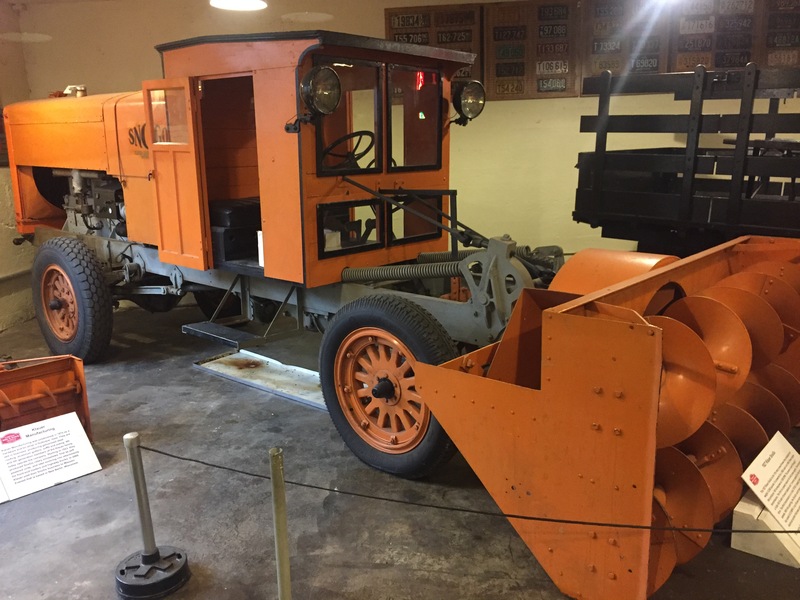 For some other Oshkosh snow machines and much more, click here. Then scroll. And more, here. Thanks to Marc, I offer this post that could also be called Océan Blue 7. 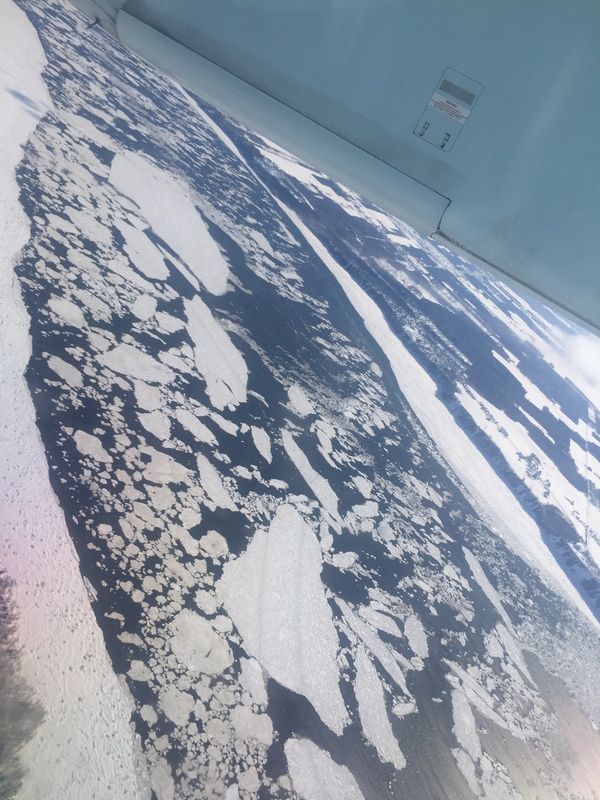 Arranged chronologically, these photos nicely show the intrusion of ice on the Saint Lawrence. taken in port of Sorel-Tracy. 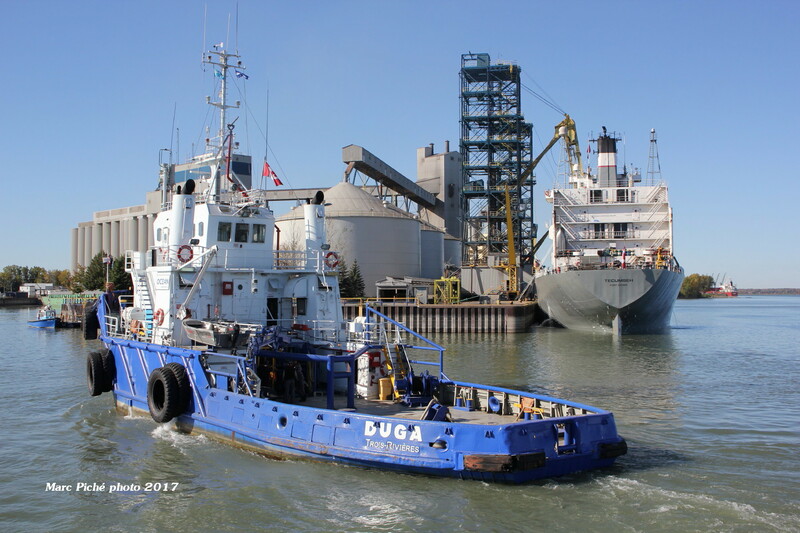 Duga (4000 hp from 2 Wichman 7-cylinder engines) was built in Lansten, Norway in 1977. 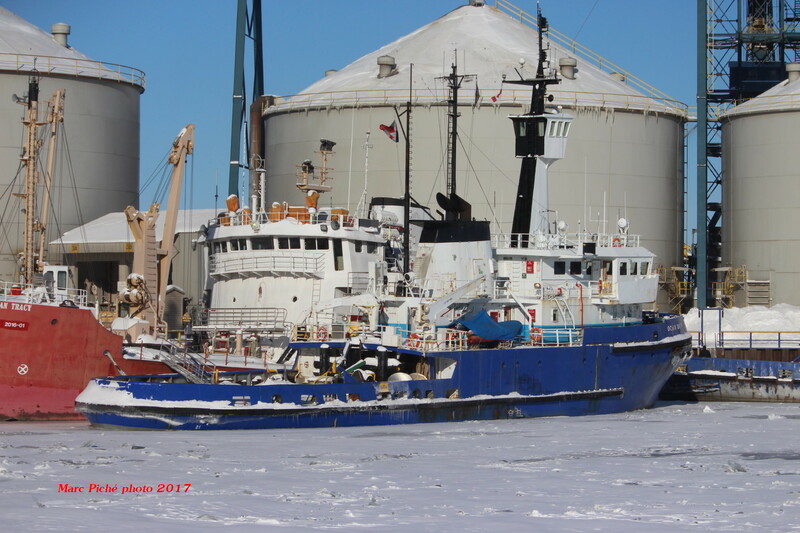 Notice laker Tecumseh at the grain dock; I took photos from the river of Ojibway at that same dock less than a week earlier. Hercule, taken on November 11, 2017, enjoys autumn warmth here. Notice the Jamaican flag on her mast just below the conical roof of the silo? 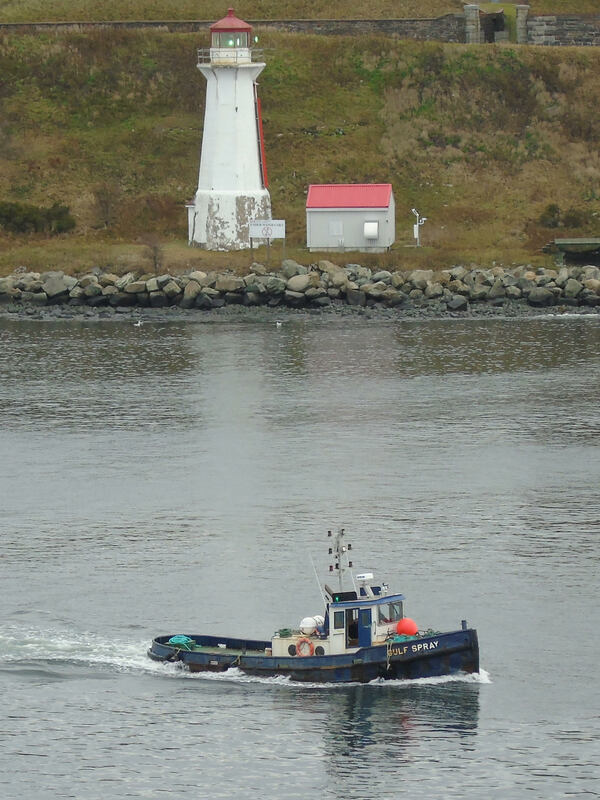 She’s been sold out of the Ocean fleet, but here are all five of her former names, including a stint as a McAllister of Canada vessel. Here’s more McAllister history. 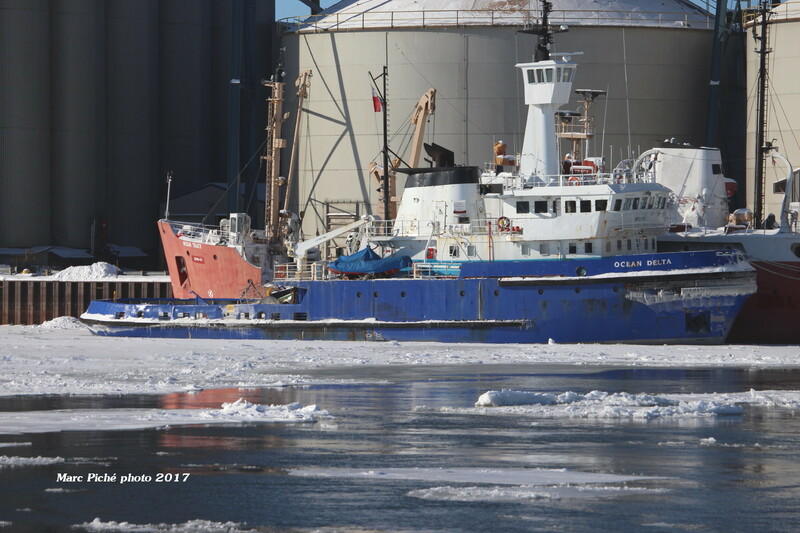 Ocean Bravo was already scraping some ice on her hull on December 26, 2017. 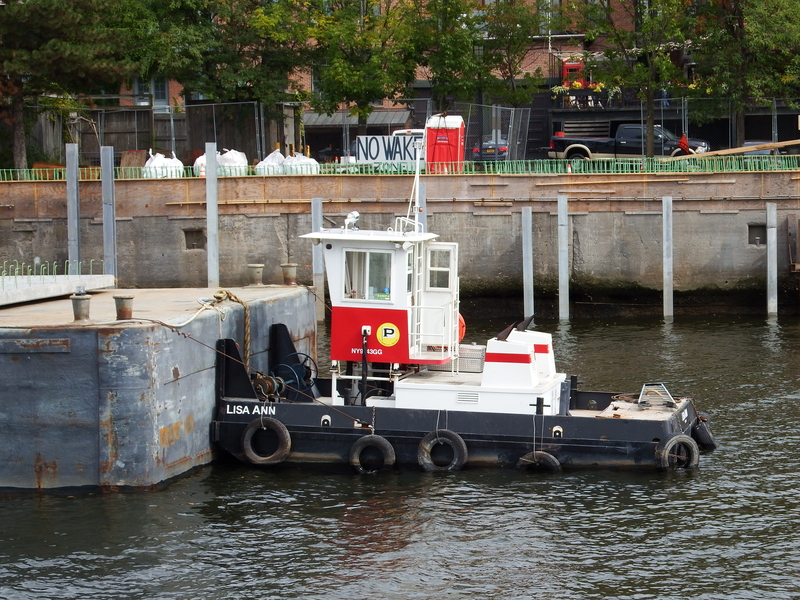 Built in 1970 right across the river from Quebec City, the 110′ x 28′ tug is powered by 3900 hp. 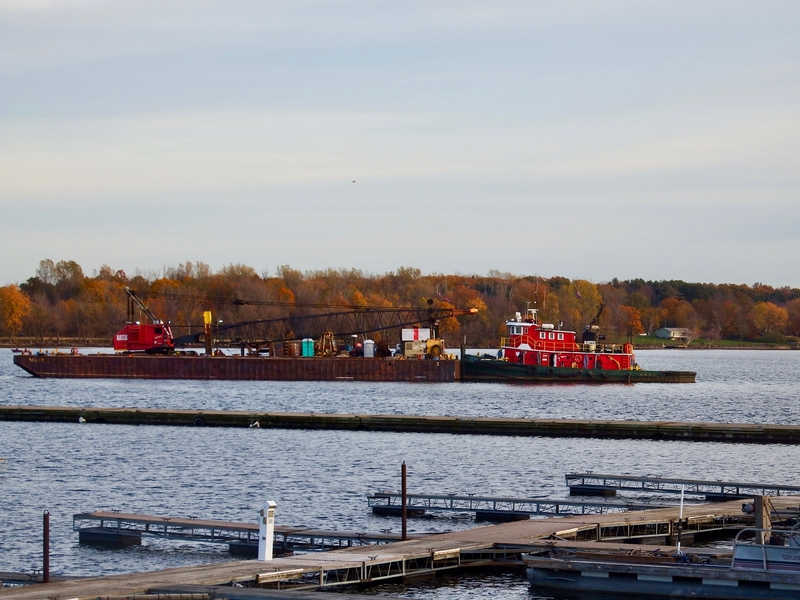 I photographed her in Trois-Rivieres in October. off Sorel. 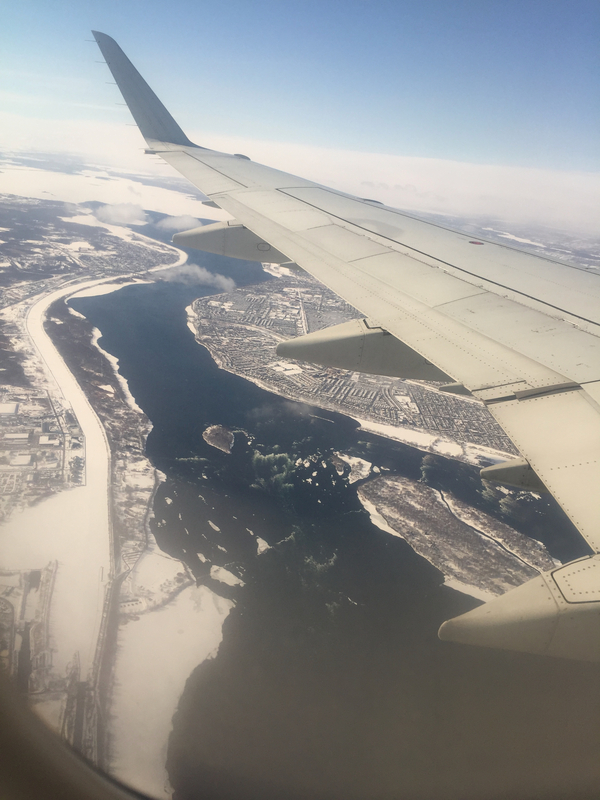 This jetster photo nicely shows the Richelieu River, the outflow for Lake Champlain. 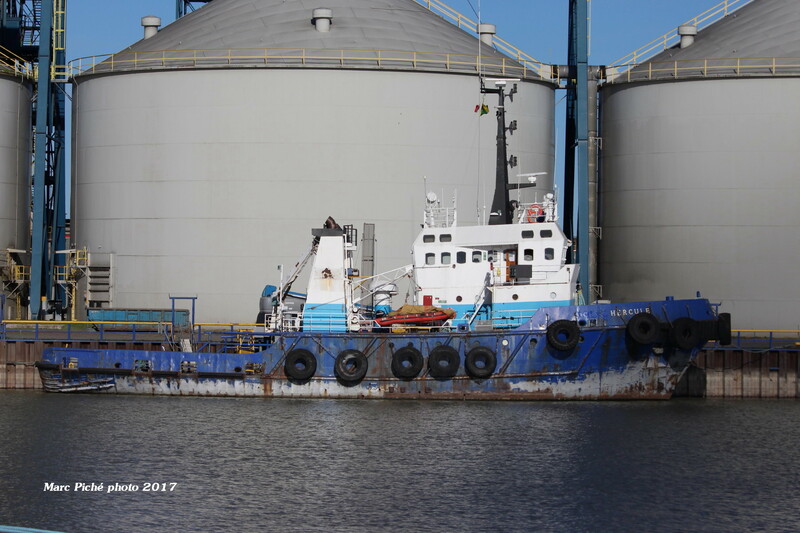 Ocean Delta is another vessel no longer in the Ocean fleet. 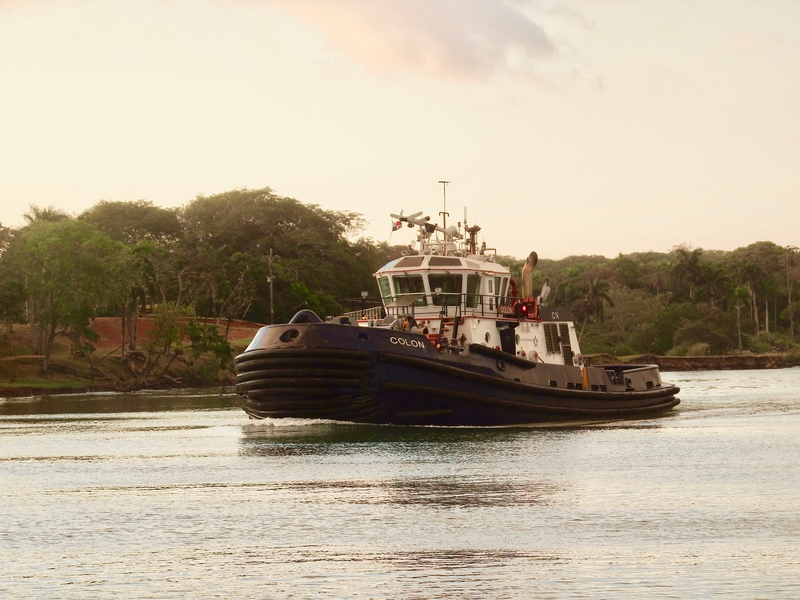 The 136′ 1973 tug is rated at 6464 hp, launched in Ulsteinvik, Norway. Birk got a photo of her here in 2012.
taken the day after Christmas. 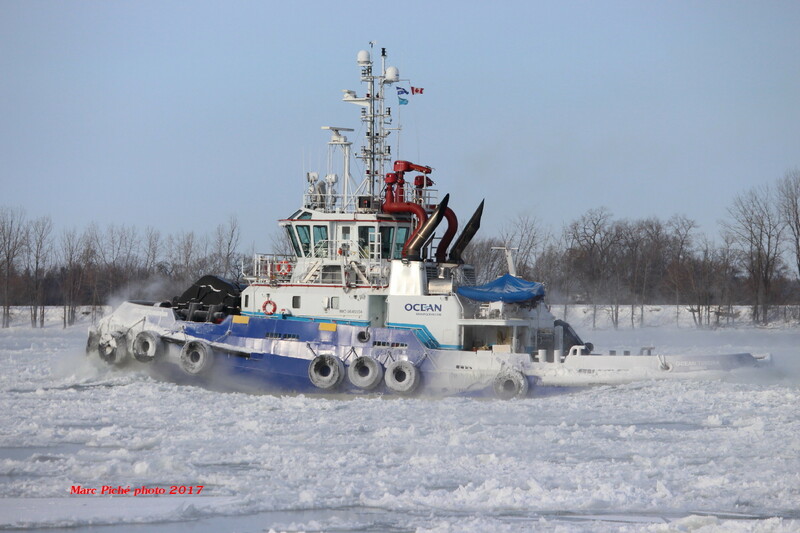 It appears that CCGS Tracy has been converted into a floating office for Ocean Group and renamed Ocean Tracy. 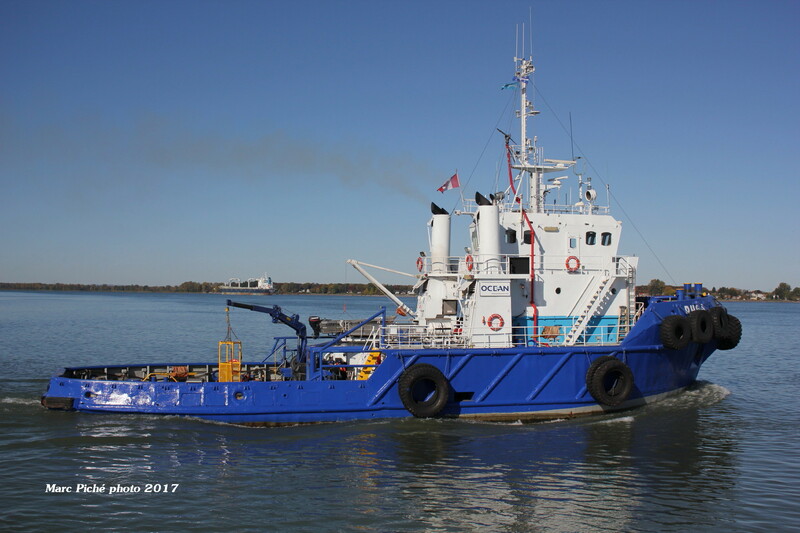 I got a photo of CCGS Tracy when she was for sale in October 2016 here. 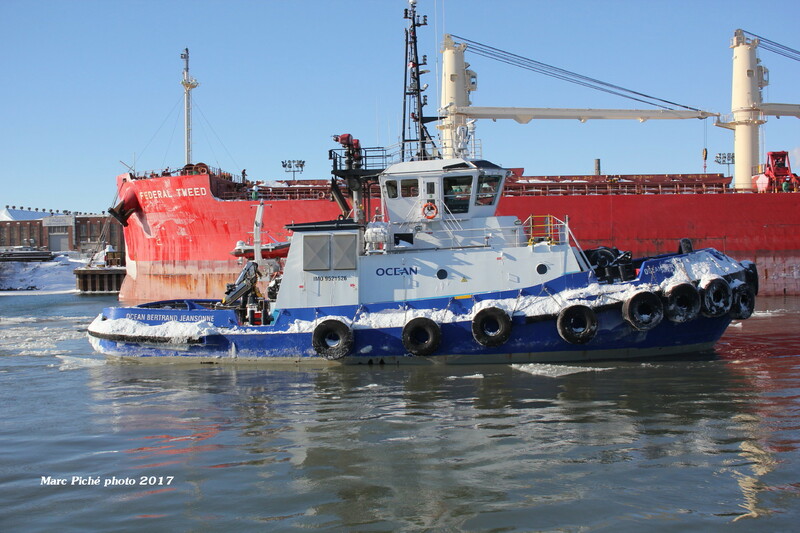 On December 30, 2017 Ocean Tundra was heading upstream to help clear the last vessels out of the Seaway before it closed. Recall the assistance Federal Biscay required to get out? Note the sea smoke as the 8,046 hp vessel exposes the relatively warmer water to the seriously cooler air. Imagine what all that ice does to the hull coatings, particularly at the bow. 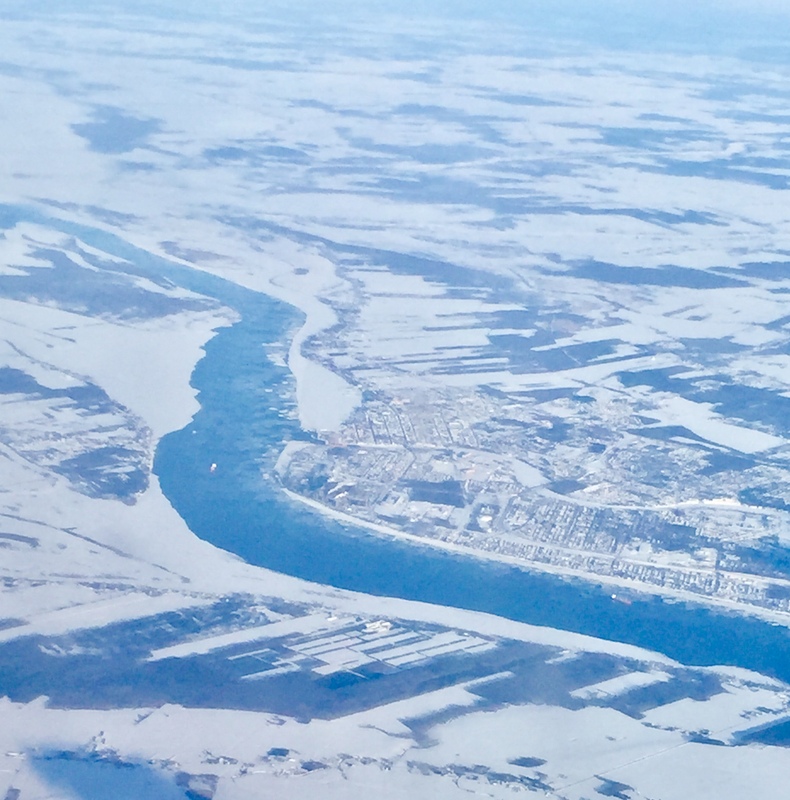 And finally, we’re up to January 31, 2018, as La Prairie muscles through the ice. 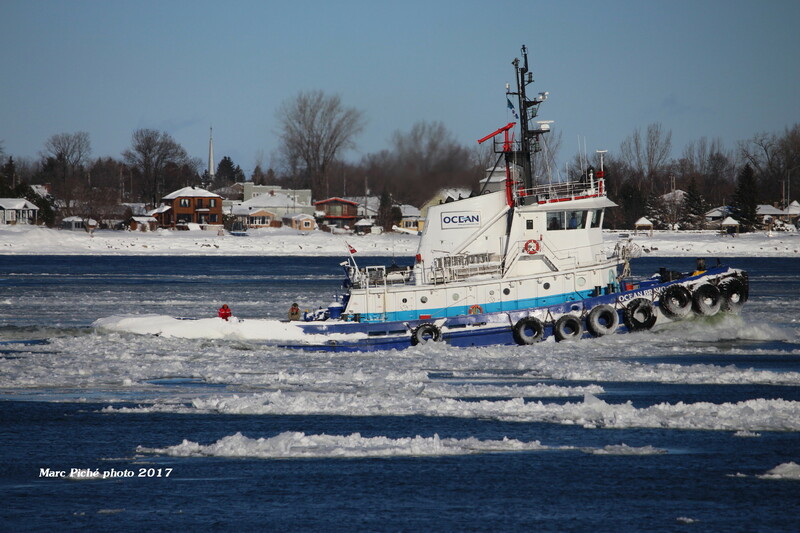 I appreciate these “seasonal change” photos taken by Marc Piché, a glimpse of traffic in winter on the mighty Saint Lawrence. Few things about flying rival “window seat,” as they complement my lifelong fascination with maps and, later, charts. Of course, few things are as frustrating as realizing I’m sitting on the wrong side of the airplane and can’t just run to the other side. 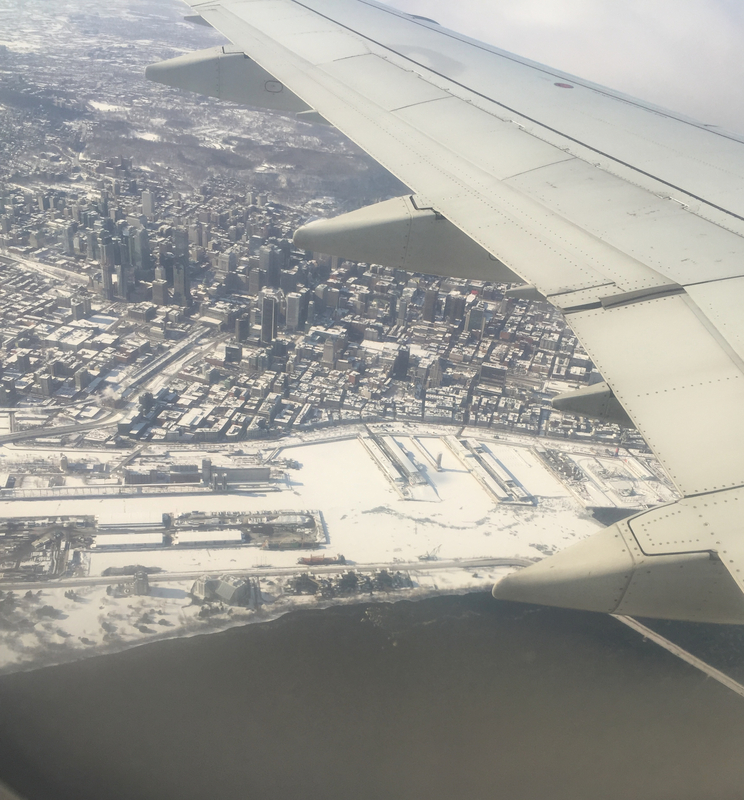 Anyhow, let’s play a game of window seat IDs of photos of the flight from NYC (LGA) to Quebec City with a change in Montreal. See what you can identify here, and then I’ll post them again with annotations/identification. #1 again. From left to right is downstream. Red number 1 is the South Shore Canal, the downstream-most canalized portion of the St. Lawrence Seaway. 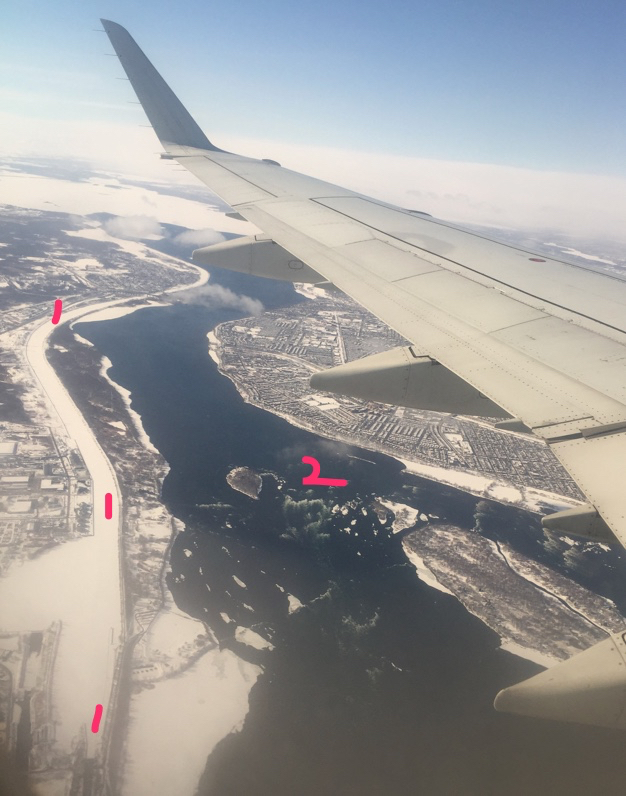 Red number 2 is the Lachine Rapids, so-named by Jacques Cartier and the whole reason for the locks at this location. Cartier thought the route to China lay above the rapids, hence, La Chine. #2 again. Again, from left to right is downstream. 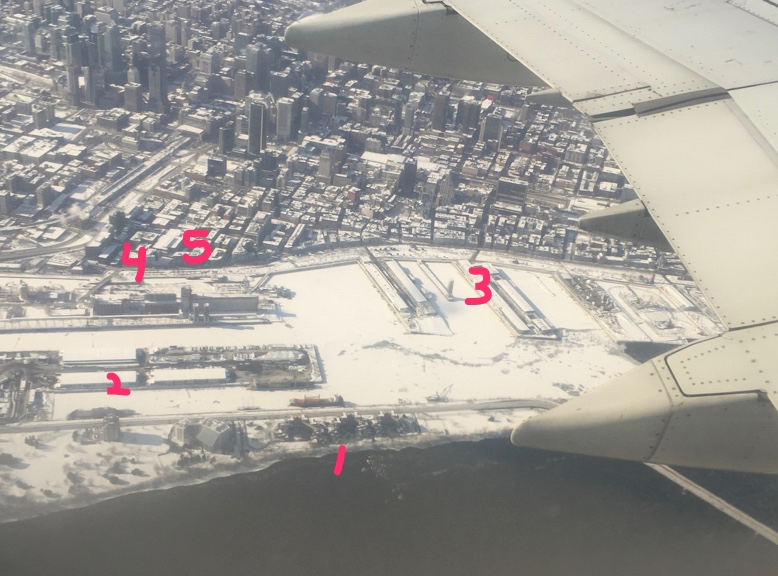 Red number 1 is Habitat 67, 2 is a certain icebound brand-spanking-new US warship that will be left unnamed, 3 is the old port of Montréal, 4 is a lock in the Lachine Canal, and 5 is a certain formerly McAllister tugboat. #3 again. Here, bottom to top is downstream. 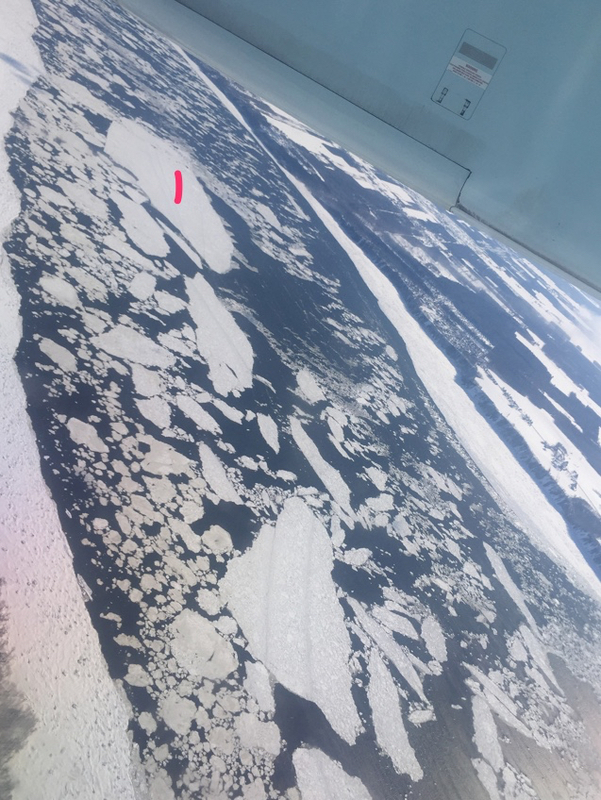 Red 1 is one of many random bits of ice flowing downstream toward Quebec City more or less at the location of Saint-Augustin-de-Desmaures, where the St. Lawrence is about two miles wide, i.e., half mile chunks of ice. #4 again. 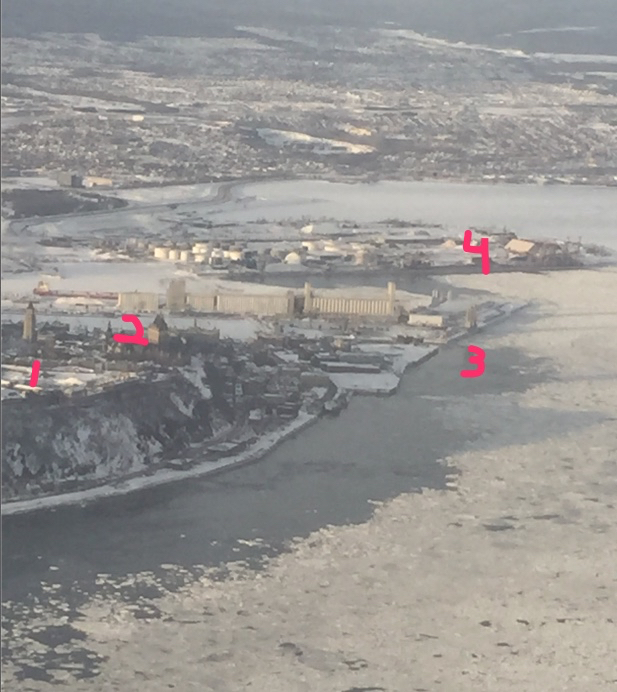 Red 1 is the Citadelle, 2 is Chateau Frontenac, 3 is the entrance to Bassin Louise i.e., a location in the ice canoe racing posts, and 4 is the bulk and containerized port of Quebec City. The long unmarked structure between 3 and 4 is the now G3 grain elevator. 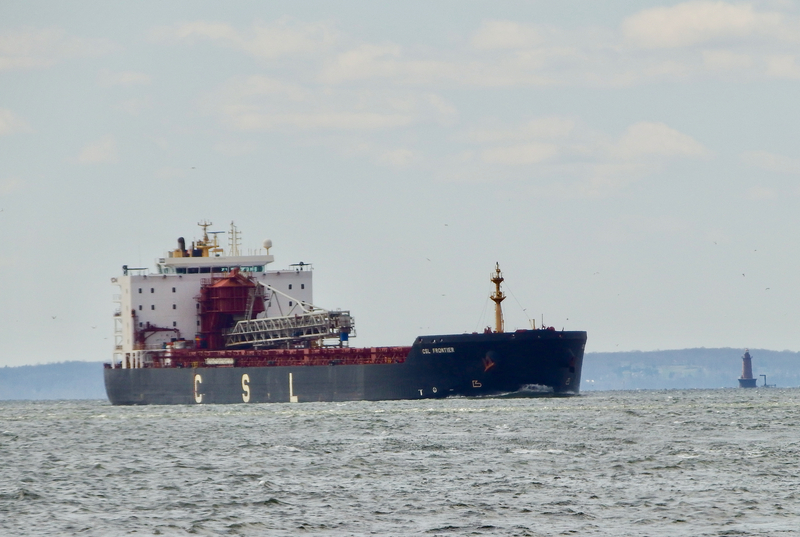 To see a G3 (Global Grain Group) ship on Lake St. Clair, click here and scroll. All photos and attempts at identification by Will Van Dorp, who’s also responsible for any misidentifications or omissions. And if you ever decide to buy me a ticket to fly somewhere, make mine a window seat or cockpit jumpsuit. Here’s an index of my jester posts, which started summer of 2017.